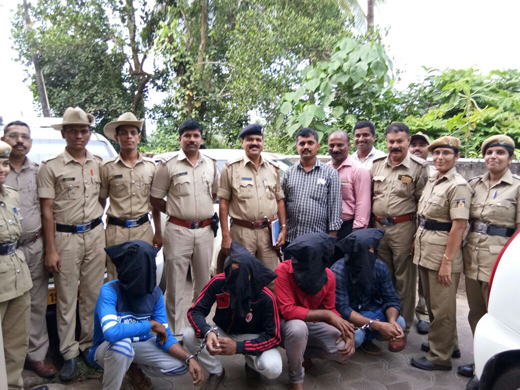 Vittal, Oct 27, 2017: Five persons wanted in a honey trap case reported from Kudtamugeru in Vittalpadnur village recently were arrested near Maani Junction on October 26, Thursday. Police have also seized Rs 7.5 lakh cash, two cars, six mobile phones, eight grams gold and passports from the accused. Those arrested are Ashraf Samsheer (27) from Thokkottu, Zainuddin (21) from Farangipet, Muhammed Iqbal (27) of Tokkottu, Ubaidulla (32) from Ullal Mukkacheri, and Farzana alias Farzama Sumayya (26) from Arehalli in Sakleshpur taluk. The honey-trap case was reported from Vittalpadnur on October 21. It is said the victim Haneef was contacted by a woman who was his Facebook friend stating she was in distress and needed financial help to treat her mother. She also sent a woman along with Hanif. However, no sooner Hanif entered his house with the woman, a gang entered the house and robbed valuables after attacking Hanif.